Genealogist Luckie Daniels, a blogger at Our Georgia Roots, is leading an effort to identify a recently discovered mystery photo of African-American Buffalo Soldiers. A Taos, NM, woman discovered the old photo sandwiched behind an illustration in a cheap frame she’d purchased years ago at an estate sale in Los Angeles. (A good reminder to look inside old framed images you might be planning to get rid of.) An auction house appraiser told her the 10 men in military uniforms were members of the US Cavalry, 9th Regiment, Company G.
The Buffalo Soldiers were the first peacetime all-black regiments of the regular US Army. They originally were members of the 10th Cavalry Regiment, raised in 1866, but eventually included the 9th Cavalry, 24th Infantry and 25th Infantry regiments. 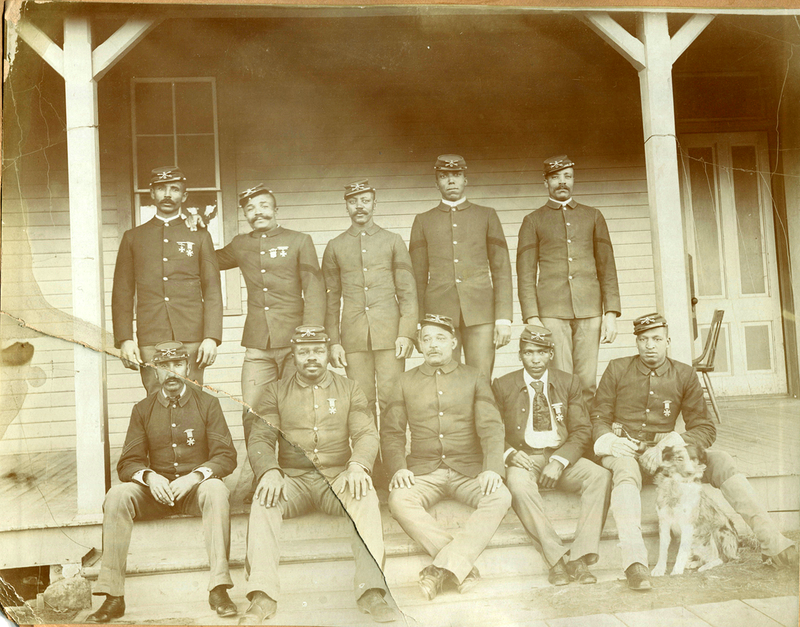 Historians disagree on exactly how they came to be called “Buffalo Soldiers,” a name that likely originated from the Indians these soldiers were known for fighting. When the owner of the photo recently visited the Taos News for an interview about the image, Daniels, a staff member there, happened to be nearby. She started the blog Where Honor Is Due to centralize the efforts of interested researchers across the country. “All insights and leads are welcome,” she says. The blog’s most recent post shares an image of 9th Cavalry Troop L wearing baseball uniforms, spotted in a video produced by the New Mexico History Museum and PBS, which might help narrow a time frame and location for the mystery photo. Buffalo Soldiers began playing competitive baseball around the 1890s. You’ll find a good introduction to this story on the Taos News website, and you can keep up with the ongoing research at Where Honor Is Due (here’s the first post). This entry was posted in African-American Genealogy, Family Photos, Genealogy Insider, Military Records. Bookmark the permalink. We’re hopeful we’ll be able to identify the Fort where Troop G held post and call their individual names soon. Thank You Diane for your efforts to get these Soldiers recognized. I’m still amazed at these Photos. I thik you did a wonderful job in helping getting their story out to the masses. Luckie is relentless when it comes to these Ancestors. I admire her work. Thanks again. What are the medals they are wearing? And what is their rank? Finding a group with these elements might help.